A large genus of about 300-370 species depending on classification. In the FSU about 130 species, mostly in the Arctic and the Caucasus. Many are well-known garden plants. They are very desirable because of their life-forms. The Caucasus. On humid rocks, on limestone, in shady places, mainly in the alpine zone. Plant forming a thick evergreen mosslike cushion or carpet. Perennial shoots repeatedly branched and creeping. Vegetative ascending shoots 3-7 cm. Leaves small, dark green, almost subulate. Corymblike inflorescence with bright yellow flowers exceeding leaves by 3-5 cm. V - evergreen plant, new leaves appear April-May. Fl - May for 2-3 weeks. Fr - July. Propagation by seed and cuttings. Prefers sunny places, but can grow in semishaded sites. Well suited for the rock garden. Z 4. Poorly known in cultivation. Far East (Sakhalin, Kuril Islands). On stony slopes in crevices near sea shore. Plant up to 35 (-50) cm. Rhizome short, oblique. Leaves 3-7 in rosette, somewhat fleshy, ovate, 3.5-8.0 cm x 5 cm, pubescent, reddish-violet beneath, green above. Inflorescence a loose panicle, flowers minute, numerous, white. V - April to October. Fl - May. Fr - June-July. P - by seed and by division. 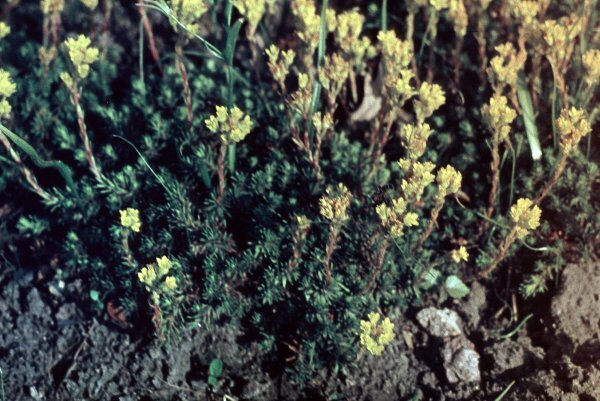 Plant in partially shaded locations in rock gardens. Z 4. Some other new species have been investigated, among them the following. Caucasus (Dagestan and western Transcaucasus). In alpine zone. Mat-forming plant 4-5 cm, leaves linear, flowers yellow. Evergreen. S. scleropoda Sommier et Levier. Caucasus (the Great Caucasus and Transcaucasus). In alpine zone. Mat-forming plant 5 cm, develops a dense evergreen cushion. Flowers yellow. Both species well suited to the rock garden. Z 5 (4). New.